The finding are really interesting! I see so many kids reading their hand held devices while walking and talking to others. I would have expected a higher preference for e-reading materials. Good to know they still like hard copy. Wish the survey had gone a little bit deeper into WHAT they were reading - Fiction, Non-Fiction, Magazines, News, Websites and HOW. 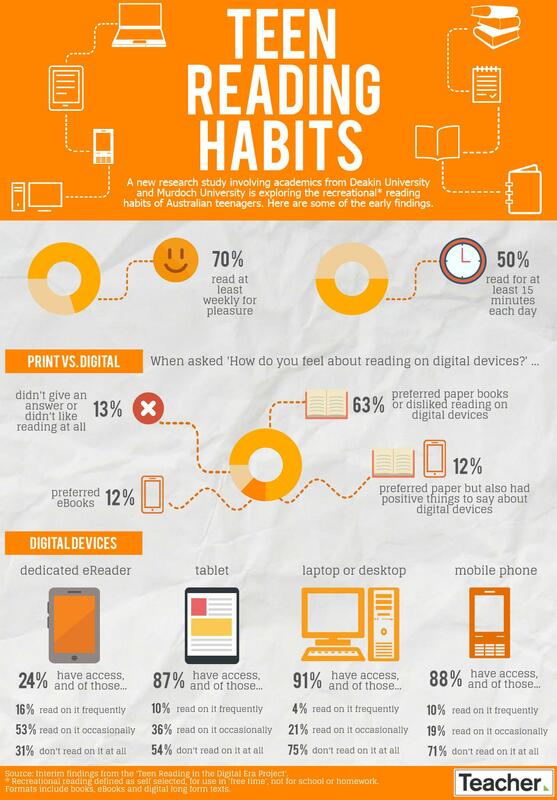 75% don’t read on their laptop and desktop at all. Really? With all those Facebook and other social media streams pumping content at them. Same with mobile phone 71% don’t read at all. I just find this hard to believe. Also nearly 1/3 who have a dedicated eReader don’t read on it at all? That’s pretty much all you can do with it, so they have one and aren’t using it?